Extron Electronics has introduced a new, two input 3G-SDI Card for the Quantum Elite videowall processing system that accepts SDI, HD-SDI, and 3G-SDI signals. The new 3G-SDI input card features Extron high performance scaling technology, motion adaptive deinterlacing, and film mode cadence detection to ensure high quality image presentation on videowall displays. Automatic source format detection captures 480i and 576i SDI sources, HD-SDI sources up to 1080i/60 Hz, and 3G-SDI sources up to 1080p/60 Hz, complying with SMPTE 259M, 292M, and 424M digital video standards. 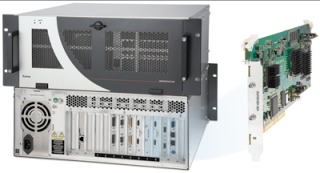 SDI, HD-SDI, and 3G-SDI input support is also available for the Quantum Connect videowall processing system. "Many videowall installations incorporate SDI, HD-SDI, and 3G-SDI signals from sources such as cameras and production equipment," said Casey Hall, Vice President of Sales and Marketing for Extron. "Quantum's 3G-SDI input card supports direct connections for these signals, eliminating the need for external conversion to DVI or other signal formats."